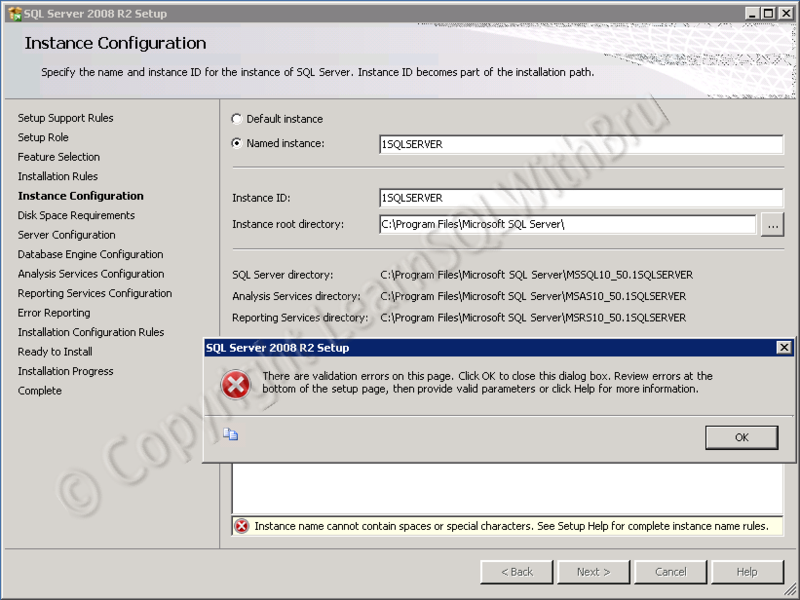 When planning to install SQL Server on a server, you need to plan ahead about the name of the SQL Server Instance. If you are installing a default instance then this is not necessary. 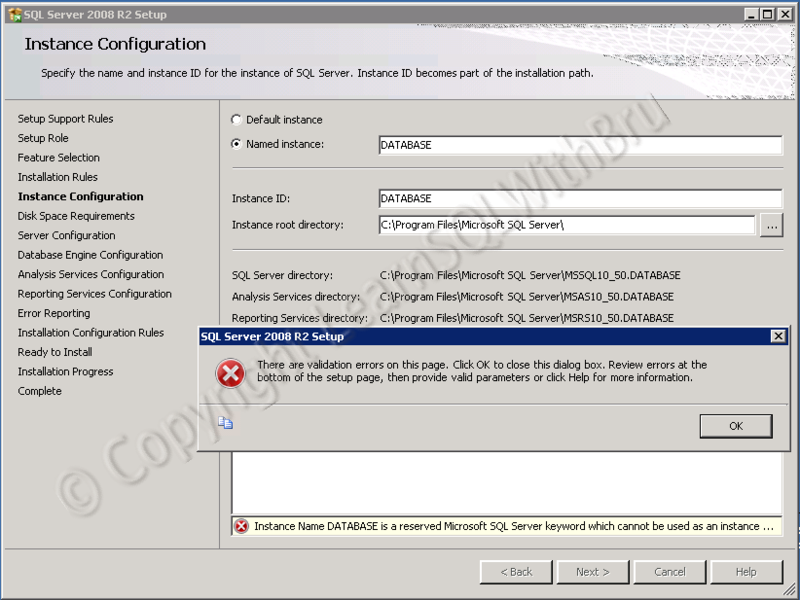 There are certain rules you will have to follow when naming your SQL Instance and lets see what are some of the acceptable names and some non acceptable names for a SQL Server Instance. Lets start with those names which are not accepted along with some examples…. 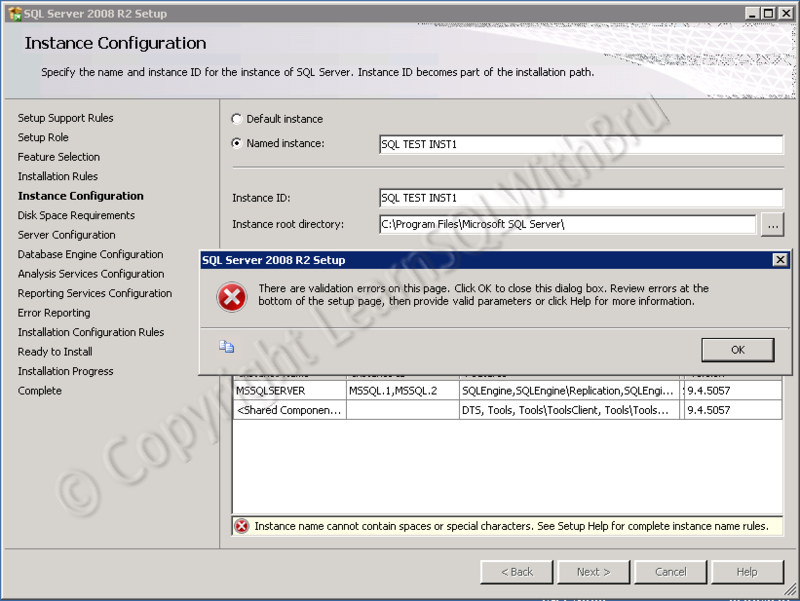 Reserved Keywords in Microsoft SQL Server are not accepted. You cannot name a SQL Instance as DATABASE or ALTER or CREATE or SCHEMA (of course Capitals Letters does not matter). See the below pic when I try to name the SQL Instance as DATABASE..
First character should not be a numerical value (0-9), it can be an alphabet (a-z), underscore ‘_’, number sign ‘#’, or ampersand ‘&’. If you try naming a SQL Instance as ‘1SQLServer’, it would not allow you to name with that name. See pic below..
Space and special characters (such as @, ^, *, \ ) are not allowed. That is, if you try naming the instance as “SQL TEST 2”, it is not accepted. Instance name should be 16 chars or less in length. This is pretty easy to understand, if you want to name the Instance too long, then you have to think again..
As long as they are less than 17 characters, some of the acceptable names can be.. This entry was posted in Learn SQL Server, SQL Server Administration and tagged Installation, Instance, Multiple Instances by Brumedishetty. Bookmark the permalink. do you have any guidelines regarding names you might consider for your instance? I’ve seen things as simple as Goofy, Mickey, Minnie, etc. I don’t find that to be particularly helpful. I’d prefer to see something more inline with the stage of development the instance supports such as Dev, QA, Prod. That probably isn’t enough info in a large installation. Then perhaps something to do with the organizations supported, or the software supported, etc. Maybe you have some ideas to offer. I’ve written a blog post on some general suggestions: http://www.mssql.no/QnA/?id=10. Whether you names is galaxies, car models or toons does really not matter, but I think you at least should stick to a standard. Naming instances like Dev, QA or Prod does only make sense to me if you should happen to have these instances on the same server, which I generally don’t suggest as you shall be able to patch the OS on the server hosting the QA database without affecting production. Aslo, I’ve had several customers with separate Dev, QA and Prod networks, with a requirement for each instance (and even server name and IP) to be identical in the various networks. Thanks for your comment and question. I wrote a blog to explain your questions and make it clear for future readers. I scheduled for tomorrow as there is another blog already scheduled for today.. I thought I would post a reply long with the link to that blog.. Hopefully your questions will be clear after you read that blog post. I shall add a link to that blog tomorrow in here.. Thanks Ole Kristian Bangås for posting a reply and also including a link to the post you have written.. I am sure it would be helpful for many..